Buying a gift experience for someone is now easier than ever on the internet. The only problem now is that everyone seems to sell them! Now you can use our website to find your gift experience or activity day, then locate the cheapest place to buy the experience. Keep up to date with all the latest experiences and offers on Twitter - Follow us on Twitter - @CheapExpDays or via Cheap Experience Days on Facebook. Here are the latest experience voucher codes and promotions. 10% off Birthday Gift Packages for two. £10 OFF National Flight Vouchers. How about a day trip in 2019 to visit The Shard in London? Read our review. 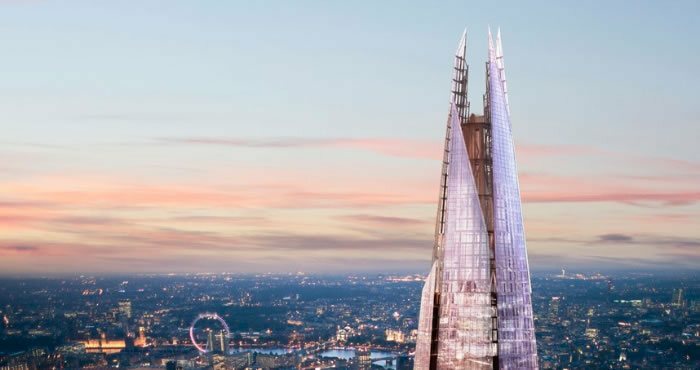 You have the choice of either just visiting The Shard, or you can get a Thames Cruise and a visit to The Shard, or visit The Shard and have lunch or even visit The Shard with afternoon tea. Read my review of The Shard. We have over 50 different Shard experiences. Prices start from only £29.95 - view them all here or take a look ar our Shard page. Unleash an Adventure with a Hot Air Balloon Flight from Virgin Balloon Flights. Right now you can get 10% off Birthday Hot Air Balloon Flight Packages for Two with Virgin Balloon Flights when you use our special discount code. see above for the codes or visit here. Don't forget Valentine's Day - Virgin Balloon Flights haven't. They are offering 10% off their romantic flight gift packages - get your Valentines discount flight now. You can also get 10% off non-gift packages if you just want to buy flight vouchers with our other discount code. See above for the codes. Get 10% OFF Virgin Balloon Gift Packages here or use the codes above. For more information visit our Virgin Balloon Flights page or buy a Virgin Balloon Flight now. 1. The Shard and Lunch or Dinner at Marco Pierre White's The Steak and Ale House. Fall in style and descend the world’s tallest and, at 178m, the world’s longest tunnel slide with admission to the The Slide at the ArcelorMittal Orbit for Two. Spiral down what is also the UK’s tallest public artwork, shoot through light and dark breathing in dramatic cityscape views as you go.